A YEAR IN JAPAN is a crafted, personal gift to English readers from author Williamson who spent four seasons in Kyoto on a post-graduate fellowship. I say "gift" not as in "free," but as an exquisitely beautiful book in design and construction, form and content. The heavy weight of the book's papers complements the many evocative one and two-page watercolors, interspersed with Ms. Williamson's handwritten text of cultural insights. In several ways, what A YEAR IN JAPAN qua book reflects is an essential theme: the aesthetic of everyday life in Japan, or as Williamson says at the outset, "the attention to detail that characterizes much of Japan--both visually and socially. I came to realize just how much thought lies behind appearances and actions there, and that these details of beauty and nuances of word and deed are both expected and appreciated." A YEAR IN JAPAN is not a guide book. For that, it's good to grab a Frommer's or a Lonely Planet. Such travel guides get one quickly oriented and save time. But if you have been to Japan, or Kyoto in particular, A YEAR IN JAPAN is a tasty postprandial--beyond your personal photos--of what it was really like. Or perfect for the dedicated armchair traveller! 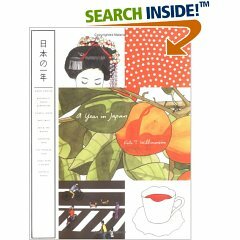 In this illustrated journal, Ms. Williamson essays what she found memorable and beautiful in Japan, so whether it's lunch with a geisha or sitting on a lace-covered seat in a Japanese taxi, you can be sure the time and attention spent painting a watercolor made the subject all the more infused with personal meaning. Because Ms. Williamson did spend a full year in Japan, she captures seasonal events and associated traditions the shorter-term tourist would likely miss. Not every tourist can be in Japan for sakura, or April's cherry blossom viewing. Or knows moon-viewing parties are still held, complete with poetry composition and special mochi (glutinous rice) sweets for the occasion. In a like vein, this reviewer saw, with some amazement, in Kyoto a horde of camera equipment-toting Japanese (mostly men) spending great effort to photograph broken reeds that joined reflections in a calm pond, which with the right angle and with the right ambient light would presumably form tubular trapezoidal images. The particular Japanese aesthetic Ms. Williamson describes in A YEAR IN JAPAN rings true to this past Kyoto traveller. I was only in Kyoto for three weeks and reading Ms. Williamson's journal, I was struck by how much more I might have seen, had I spent a full year, as she did--or could see if I return. As Americans, we often hear things differ in Japan. But too often these differences are said to be more expensive this, more crowded that, and, of course, smaller homes. What Ms. Williamson has done with this fabulous collection of watercolors and essays is show in so many ways how and why Japan looks different. Whether it's food (cozy-wrapped apples or ohagi--rice balls with red beans), clothing articles (designer umbrellas or an infinity of socks), or people (sumo wrestlers, tofu vendors, or older "sparkly ladies" who dye their gray hair Jello colors), A YEAR IN JAPAN sumptuously illustrates what's compellingly different about Japan. True, the discussion of the Hello Kitty merchandising phenomena is missing, but Ms. Williamson amply makes up for that minor oversight with an excellent essay about free Sunday public performances by an Elvis-inspired group called the Kyoto Rockabilly Club. In sum, read A YEAR IN JAPAN as an exploration of much that's memorable about Japan, all in a wonderfully wrapped present of images and words!